Entomologist Mark Moffett found this carrot-eating giant weta in a tree on New Zealand's Little Barrier Island. The cricketlike critter weighs 2.5 ounces (71 grams) and has a length of 7 inches (17.8 centimeters). Is this the world's biggest bug? As with all superlatives, it depends on your definition. 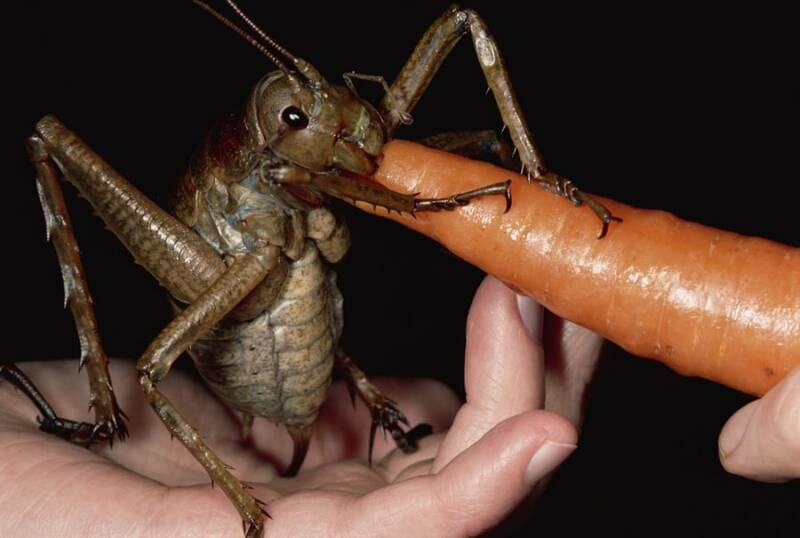 But the sight of a New Zealand giant weta chomping down on a carrot surely has to give you the creeps, even if it's rivaled by other giant creepy crawlies. This particular species of the cricketlike creature — known as a giant weta or wetapunga to the Maori, and as Deinacrida heteracantha to scientists — is found only in protected areas such as New Zealand's Little Barrier Island. That's where Mark ("Doctor Bugs") Moffett, an entomologist and explorer at the Smithsonian Institution, found the specimen after two nights of searching. "The giant weta is the largest insect in the world, and this is the biggest one ever found," Britain's Daily Mail quoted Moffett as saying. "She weighs the equivalent to three mice. ... She enjoyed the carrot so much she seemed to ignore the fact she was resting on our hands and carried on munching away. She would have finished the carrot very quickly, but this is an extremely endangered species, and we didn't want to risk indigestion." The carrot-crunching cricket went viral today, and now questions are starting to emerge about the "biggest bug" label. The information accompanying the picture lists the insect's weight at 2.5 ounces (71 grams) and its length at 7 inches (17.8 centimeters, supposedly for wingspan, but keep reading). The New Zealand-based news site Stuff.co.nz checked that with Landcare Research entomologist Thomas Buckley. "From the picture, it's a female, but it just looks like an average-sized one of that species," Buckley said. Even the biggest giant weta has its rivals in the insect world. By some accounts, goliath beetles can reach a weight of 100 grams (3.5 ounces) during their larval stage and achieve a wingspan of nearly 10 inches (25 centimeters). The White Witch moth, meanwhile, has a wingspan of up to 12 inches (31 centimeters), which is wider than the wings of a sparrow. But if you confine yourself strictly to adult insects, and define "big" in terms of weight, Moffett appears to have a good case. He told me in an email that the giant weta he found counts as the "largest one weighed, as far as I have seen recorded anywhere." Now, if your definition of a "bug" takes in more than insects — say, the giant crustaceans known as isopods, which are super-sized versions of rolypoly bugs — then you're talking about bugs of truly horrific proportions. Do you have tales of monster bugs to share? Add them as comments below. Update for 9:30 p.m. ET Dec. 2: Some of the reports about this giant weta make it sound as if the darn thing might bite somebody's finger off, but that's bogus. This CafeTerra posting describes the bug as a vegetarian and "the gentle giant of the insect world." They survive only in protected environments because they've been driven to near-extinction by rats and other invasive predators on New Zealand's main islands. The Kiwi Conservation Club says the bug is a "docile creature and does not kick or bite." Some reports have referred to the giant weta as having a 7-inch wingspan, but Moffett told me that the insect is "wingless, or virtually so." It's so heavy that it can't jump. It's so big that it can't easily hide from predators. And yes, it's edible. Update for 11:30 p.m. ET Dec. 2: Moffett shed more light on the "biggest bug" question in a follow-up email: "I did not measure anything but the weight (one should correctly call it the 'world's heaviest adult insect'), but a rough estimate from the picture suggests an outstretched leg might be 7 inches. The weta is essentially wingless: no wings to see at all, let alone a seven-inch wing. [As to size:] I've seen a walking stick nearly 19 inches long in Sarawak, Malaysia, but it weighs next to nothing!" Update for 3 p.m. ET Dec. 4: Uh-oh ... The New Zealand Herald quotes entomologist Ruud Kleinpaste as saying that the heaviest giant weta on record weighed 72 grams, which would be a gram heavier than Moffett's carrot-eating friend. Kleinpaste also said it's not unusual for the bugs to munch on carrots. But even if Moffett's weta is an unremarkable "wee 'un," Kleinpaste is glad for the publicity: "I think it's wonderful as long as weta get the attention and not that idiot American." How about a yummy scoop of grasshopper? Connect with the Cosmic Log community by "liking" the log's Facebook page, following @b0yle on Twitter and adding the Cosmic Log page to your Google+ presence. You can also check out "The Case for Pluto," my book about the controversial dwarf planet and the search for new worlds.